alaTest ha raccolto ed analizzato 28 recensioni su Cingular 8525. La media della valutazione per questo prodotto è 3.5/5, confrontata con la media della valutazione di 4.3/5 per altri Cellulari. Gli utenti sono impressionati da portabilità e connettività. In aggiunta, design e affidabilità ottengono ottime recensioni. Abbiamo analizzato differenti valutazioni di esperti ed utenti, età del prodotto ed altri elementi. A confronto con altri Cellulari, Cingular 8525 ha ottenuto un alaScore™ complessivo di 80/100 = qualità Molto buono. The very fast data access offered by this PDA phone is undermined by poor battery life and a bulky design. The first high-speed Cingular smart phone makes a powerful mobile office. HSDPA and Wi-Fi for high-speed Internet. Zippy processor. Stereo Bluetooth. Not the greatest keyboard. Earpiece could be louder. Some hiss on calls. 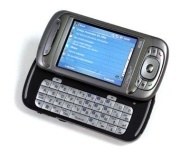 The Cingular 8525 is a Pocket PC phone with a built-in keyboard, Wi-Fi b/g, and 3G cellular-wireless networking. Adama D. Brown brings us this review. While it would have been nice to see some slightly flashier upgrades for the price, such as more memory, or an improved screen, the 8525 delivers in two critical areas--wireless performance and speed. The 8525 – Cingular's version of the much-heralded HTC Hermes – has been as good, or better, than expected – a very impressive device for power users and business users. If you're just looking for a powerful and top-class Pocket PC phone device with 3G and the whole nine yards on specs, then this is also a great choice.